Using our EZ Quote System is easy. Just select your desired quantity, then add all the options that you want. The total is displayed at the bottom of the EZ Quote form. You can play the “what if” game by changing quantity or options and seeing how they affect the final price in real time. Once you are satisfied with your options, just fill in the project information and add the order to your cart. You can then check-out and pay for your order. It's EZ! If you are new to disc packaging and duplication, or are unsure of any of the options on the form, just scroll down to the bottom of the page where we explain each option in detail. Still not sure? Just give us a call and we'll help clear things up for you. 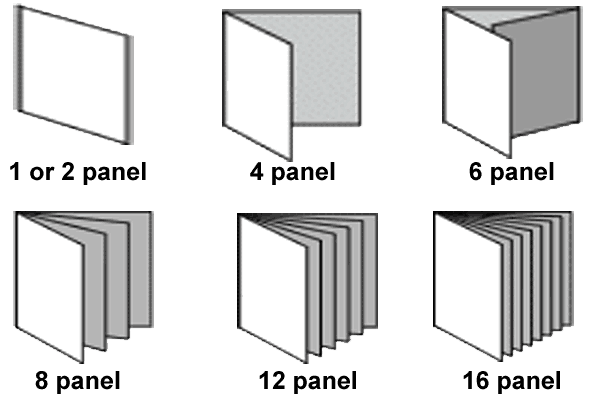 Select how many panels your insert has. The front cover is panel 1. a 2 sided insert is 2 panels. Folded once is a 4 panel. Folded twice is a 6 panel. 8-12 and 16 panels are multiple 4 panels saddle stapled together. Using our 7 day service gives you more than a great price... you also get free Photo Quality Color Printing on the disc face. These prints are high resolution photo quality glossy prints on the disc. This printer prints almost all the way to the center hole. You can still print the other options but since it is the same cost... go wild! The tray-card is the paper that is placed under the tray that holds the CD in a standard jewel case. It has the fold-up spines that become the spines or edge of the case. It is available in a single side print with a black tray or a two sided print with a clear tray. With our 7 Day service, either is available for the same cost!